Welcome to our fortnightly update. Hoping you all had a good weekend. My apologies for not posting on Friday but I had an annual leave day. So here is our fortnightly update. With only 3 weeks to go until Christmas it looks like lunch at my place is getting bigger by the day! Thanks to everyone that has replied, see my checklist below to see that we are on track for our virtual Christmas lunch! @socoda will be bringing cake, @Annie C Christmas pudding (with traditional sixpences), @kmakm trifle, @SoldierCrab good alcohol, @arpie Ukulele’s, @Blossom1961 truffles. I will be bringing the Christmas roast and vegies and provide the afternoon entertainment game of Tombola (Italian bingo)! Thought we could have a game or two while we listen the Ukuleles! Oh almost forgot, BYO virtual chair! For anyone who has not rsvpd there is still time! Marianne and I held our second teleconference this year with our online major contributors and group leaders last week. This was a great opportunity to hear your thoughts and ideas on how we can best support new members to the online forum and our plans for moving ahead in 2019. The last Friday update for this year (I promise it will be posted on a Friday!) will be 14 December. I’m planning to include information regarding moderation of the online network over the Christmas New Year break and information regarding available support services over the holiday period. 1.Trying not to feel resentful Great thread commenced by @Milly21. Having completed her cancer treatment over 18 months ago, Milly21 is feeling resentful about the lack of support she has received from family and friends. 2.The new me Great thread commenced by @kitkatb. The ‘new me’ describes how things have changed and how hard it can be to reengage with social activities and connections after a breast cancer diagnosis. 3. Friday funnies Great thread commenced by @kmakm, happy reading! 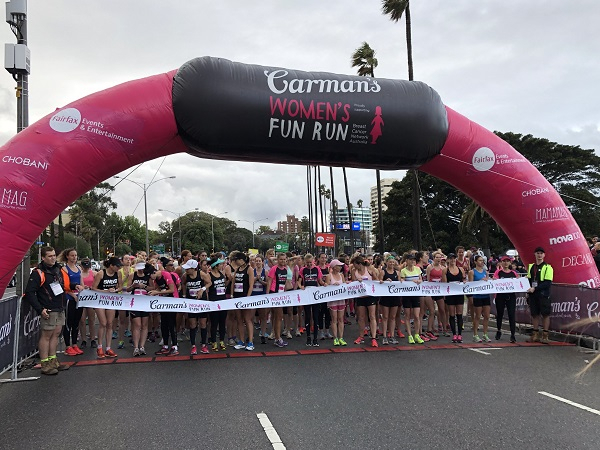 What an amazing day was had this Sunday with the Carman’s Women’s fun run. The event was a fabulous success with a total of 5,800 participants and over $200,000 raised so far and counting! Webcast – Just diagnosed what’s next? I have noticed that there have been quite a few new online members’ registrations recently including members who have recently been diagnosed with breast cancer looking for support and guidance regarding treatment options. I wanted to highlight the following BCNA resource that you may not have seen on our website. The webcast titled ‘Just diagnosed what next?’ In this webcast leading experts provide important information to assist with decision-making and coping in the early days after initial diagnosis. You will also hear from a breast cancer survivor, who will share tips on what she wishes she’d known when first diagnosed and trying to make treatment decisions. Today is International Day of People with a Disability and the theme for this year is empowering persons with a disability and ensuring inclusiveness and equality. Coping with breast cancer can be difficult. If you are also living with a disability, you may face additional challenges. The needs of people with disabilities diagnosed with breast cancer may vary depending on individual circumstances, type of disability, financial situation, support networks, culture and many other factors. Appropriate information and support can help you to feel more in control and able to participate in decisions about your treatment and care. Have a great week everyone, take care and look after yourselves. Thanks Giovanna, super update. Pity most of those Christmas cards have sold out! And wow, $200,000 raised at the Fun Run! Amazing. Now what about a Fun Hobble?! Oh who are the major contributors? Oh sensational @wendy55 my son was asking for a pavlova the other day! And bon bons, love that! I'm also doing the roast potatoes remember! Awesome @FYONA1 look forward to trying the baklava! I'll bring the champers unless someone's already on that! Hi @iserbrown and @BlackWidow. The teleconference we held is part of regular meetings we hold with members of the online community to check in re ideas, issues and plans often which have been raised by online members. So that this meeting is manageable we invite members who are either group leaders or the 10 members who have posted the most in the previous 2 month period. Selecting members this way is impartial and means we get a different make up of membership at each meeting as members come and go and their particpation rate fluctuates over time. Having said that, we probably had too many members at this meeting so Giovanna and i will be discussing how best to do this moving forward. Please keep in mind that members are always welcome to provide us with feedback, ideas etc via direct message at any time. Members frequently do this and we value their contribution. Sounds like it's time for a survey to all members. Ability to participate on a constant basis or occasionally on the online forum varies for lots of reasons. The confusion has arisen by the major contributor wording, a listing which appears on the activity page. Grrr..another webcast for early stage breast cancer!